The author of a new bus and coach driver training guide was so disgusted at the lack of resources available he decided to write one himself. 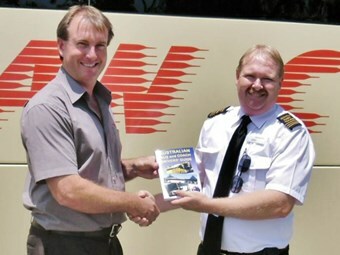 The Australian Bus & Coach Drivers' Guide was released last week, and copies have already been bought by Queensland operators. The book has been about 12 months in the making, according to Sunshine Coast-based author John Duffy. Duffy, who is now trained to be a heavy vehicle instructor, says he was "disgusted" at the lack of driver training resource for the bus and coach industry. "There’s lots of stuff out there for trucks." Duffy says the book provides a comprehensive guide from gaining your heavy vehicle licence right through to the highest available qualification. He says the content from the book has come from his own knowledge, as well as those in the industry who were willing to help. "The biggest issue is there’re a lot of older guys who don’t want to share their knowledge," he explains. As part of his recently completed Certificate IV in transport Heavy Vehicle Trainer, Duffy had to write a manual about how he would teach potential students. "After I finished my course, I just kept adding to it and adding to it," he says, which includes other things which weren’t included such as emergency procedures. "I thought ‘this is going to go somewhere." The book has since been reviewed by other drivers and is being peer reviewed by the industry, including the Queensland Bus Industry Council. Logan Coaches General Manager Peter Bowerman recently bought copies of the guide to be used as a training resource. Bowerman says the book is well done, and covers all aspects of driver training. "Often the minor things get overlooked. It covers the full spectrum of the role." He says it will probably be incorporated into their driver training program.